As you’ve probably heard, Blizzard is cancelling the World of Warcraft: Trading Card Game. Most likely this stems from their focus on Hearthstone: Heroes of Warcraft. While I hadn’t played it in years, saying goodbye to a good game makes me a bit sad. I’m not sure that I ever played a 1v1 match against another player; it was the raid decks that fascinated me. WoW: TCG features raid decks modelled after their World of Warcraft counterparts. 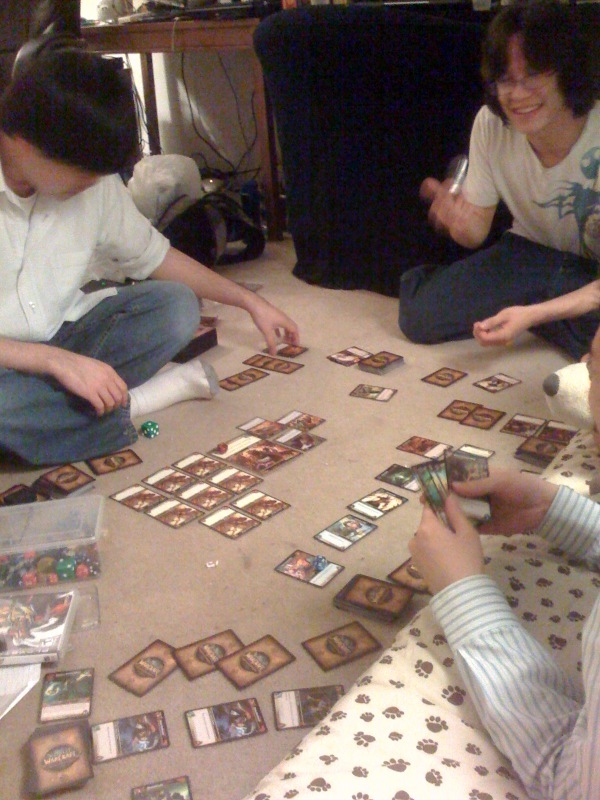 In the photo above (taken years ago), one player is controlling the Onyxia raid deck. We had five players banded together to defeat Onyxia. It was a new concept (at least to me) in TCGs, and I enjoyed it immensely. Besides defeating Onyxia, I also defeated Molten Core in normal (it had different difficulties) with five other players. There were seven raid decks released – Onyxia’s Lair, Molten Core, Magtheridon’s Lair, Black Temple, Naxxramas, Assault on Icecrown Citadel, and Battle of the Aspects. Maybe it’s a waste of money, but I suddenly have the strong urge to purchase every raid deck. They’re fun, and I can’t stand the idea of them going away! I’ll pick up Assault on Icecrown Citadel at the very least. ← Suggested Reading: Of solving LFR woes, instance scaling, the WoW TCG, fishing, and more.